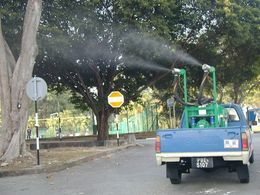 The Micron AU9200 is a vehicle-mounted cold fogging machine developed specifically for the control of adult mosquitoes, flies and similar pests using both conventional and water-based ULV insecticides. The Micron AU9200 provides excellent control of spray droplet size and insecticide output, whilst being easy to operate and maintain. It is intended for use by municipalities, pest control contractors, military camps and similar organisations requiring reliable, cost-effective pest control. The machine uses a reliable 20 HP two cylinder 4-stroke engine to drive an air blower. The sprayheads contain no moving parts and are fitted with unique interchangeable orifice discs for adjustment of spray droplet size. This insecticide application equipment has been manufactured in compliance with International Standards for Equipment for Vector Control - technical dossier available on request. Durable welded steel frame designed to withstand operation in rough terrain. Engine and blower supported on anti-vibration mounts. Universal mounting base for easy installation on a wide range of vehicles. Narrow frame allows easy access to bed of vehicle alongside sprayer. 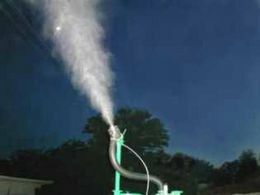 Two sprayheads use highly efficient vortex nozzles to produce narrow spectrum of spray droplets. Interchangeable nozzle outlets provide optimum droplet size for both conventional and water-based ULV insecticides. The two sprayheads can be independently adjusted horizontally and vertically for optimum delivery of spray to target. Tall sprayhead mounts ensure spray is released well above air turbulence behind vehicle. Reliable 20 HP Honda 4-stroke engine with electric start. Engine installation approved by Honda and engine covered by Honda worldwide warranty through local service centres. Large 20 litre fuel tank gives 3 hours spraying time. Efficient and reliable rotary blower delivers air to sprayheads. Large, easily maintained air inlet filter designed for use in dusty environments. Engine and air outlet silencers minimise noise during operation. Easy access to engine for servicing. 50 litre insecticide tank maximises spraying time without refilling. Large 180 mm diameter tank filler cap with filter minimises risk of spillage whilst filling. Drain valve allows easy and safe emptying of tank after use. 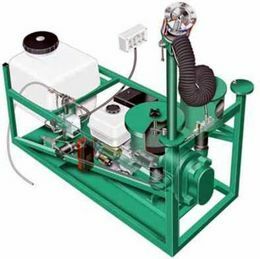 Magnetic drive positive displacement insecticide pump eliminates need for shaft seals for maximum reliability and compatibility with ULV formulations. 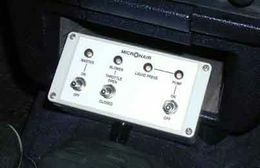 Control box in cab of vehicle for remote operation of pump and engine throttle. Indicator lights on control box give simple indication of correct operation of sprayer. Engine can be stopped from control box in vehicle cab. Safety interlock ensures that sprayheads can only operate whilst engine and blower are running, eliminating accidental discharge of insecticide. Automatic oil level sensor stops engine if the oil level is low, preventing engine damage. 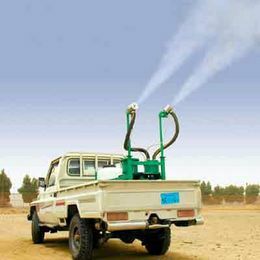 Large capacity insecticide filter with easy access for cleaning. PTFE lined hoses with stainless steel outer braid for maximum resistance to insecticide and accidental damage. All pipe fittings made from brass or stainless steel for compatibility with conventional and water based ULV formulations. Option of manual flow control (with fixed restrictors or adjustable valve) or electronic flow control from vehicle cab. Simple operator controls in cab of vehicle. Output rate can be fixed with orifice discs to prevent accidental changes being made whilst in operation. Electric throttle control allows engine to be set to idle when not spraying, reducing noise and fuel consumption. All components easily accessible for maintenance. No specialist tools or equipment required for routine maintenance. Simple control system for maximum reliability and easy maintenance. There are no electronic systems in the Micron AU9200M version. Routine maintenance can be carried out by any competent vehicle mechanic. All spare parts readily available from Micron Group and distributors. Service and spare parts for engine available through worldwide Honda service centres.